UMB Blog » Economy » Will the labor market create an economic soft landing? Will the economy really over-heat if businesses can’t find anyone to hire? Chief Investment Officer KC Mathews provides thoughts on this topic in his latest economic perspective, which was recently featured in ColoradoBiz Magazine‡, as well in recent commentary with CNN‡. On the surface, the business cycle is relatively simple—it’s the natural fluctuation of the economy between periods of expansion and contraction. Many times, the cycle begins with stimulus, both monetary and fiscal, which jump-starts the economy and begins a multi-year expansion commonly known as boom times. Then, as the economy gains momentum, it tends to overheat, causing inflation. To combat this over-heating, the Federal Reserve (Fed) removes monetary stimulus by increasing interest rates. This controls inflation and, historically, ends the expansion, completing the cycle and usually pushing the economy back into recession or bust times. Forecasting long-term potential economic growth should be easy. All you need to forecast is productivity gains and labor force growth. Add them together, and you have potential or trend gross domestic product (GDP). The current expansion is in its ninth year, heading toward setting the record for the longest expansion in history (currently at 10 years, 1991 to 2001). Since the Great Recession, 2008 to 2009, the U.S. has experienced an average real GDP growth rate of only 2.2 percent, which is well below our usual GDP rate during a recovery. So, we saw the Great Recession followed by an expansion we call the Great Moderation. Potential GDP over the Great Moderation period was 1.4 percent—the product of a whopping 0.5 percent labor force growth rate and 0.9 percent productivity gains. In the near future, we don’t see much changing. In 2017, the U.S. economy grew at 2.3 percent. This year, due to fiscal stimulus, export growth and other factors, we expect the economy to grow 2.9 percent. However, in 2019, we expect some slowing and a GDP growth rate of 2.5 percent. All these figures are above the potential or trend growth rate for the U.S., so we are possibly in the “overheating” range—inflationary pressure is possible. Labor force growth can be a function of population growth, and we can grow our population several ways, including increasing birth or immigration rates. The U.S. population is more than 328 million. There is one birth every eight seconds, one death every 12 seconds, and one international migrant every 29 seconds for a net gain of one person every 12 seconds. This may sound like substantial growth, yet the U.S. population is growing at a snail’s pace of 0.7 percent. The five-year average growth rate of the labor force, ages 16 to 65, is also 0.7 percent. Business owners tell us that it is very difficult to fill open positions, potentially hindering future growth. The empirical data supports these claims. Today, there are 6.7 million job openings, but only 6.6 million unemployed—those categorized as willing and able to work and who are actively seeking employment. 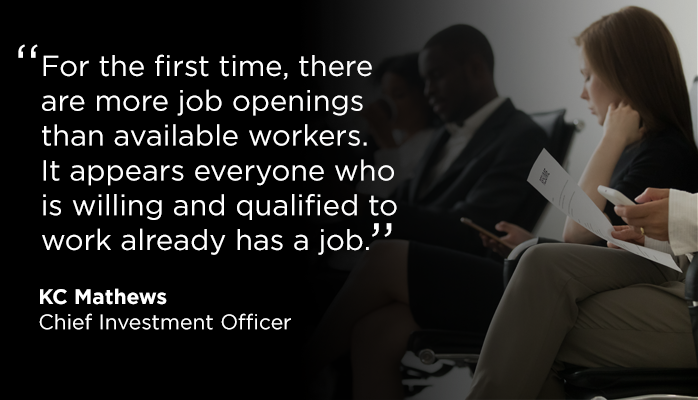 For the first time, there are more job openings than available workers. It appears everyone who is willing and qualified to work already has a job. Keep in mind that the Fed has two primary goals: stable inflation and full employment. We appear to already be at full employment. So, what if businesses can’t find workers to fill open positions? In theory, economic growth will stall. The economy won’t overheat, and there would be no need for the Fed to aggressively raise interest rates. The tight labor market may play a role in constraining the economy from growing too fast and overheating, but, at the same time, it may be responsible for sparking some inflationary pressure. Wage inflation has been range bound, currently growing at 2.7 percent, a peak for this cycle, but still well below the peaks of previous ones. It would seem obvious that the shrunken pool of available workers will put some upward pressure on wages and inflation. This is the concern driving the Fed’s stated intention of continuing to increase rates for the foreseeable future. However, it appears the structural forces that have kept wage inflation in check during this cycle will remain in place. Technology, automation and a global work force seem to be keeping wages and inflation from spiking higher. The Fed started to increase short-term interest rates in December of 2015. After the Great Recession, the Fed had anchored interest rates at virtually zero for almost a decade. Because the economy is now clearly on stronger footing, the Fed’s current intent is simply to remove the incredible stimulus that’s been in place and to “normalize” rates, rather than specifically increase rates to slow economic growth. If the tight labor market does in fact begin to hamper economic growth, the Fed might curb the pace of interest rate hikes. We expect Fed Funds to continue to rise throughout 2018 and 2019, peaking at 3 percent. There would be no need to additionally increase rates if businesses can’t grow due to the lack of available workers – which will keep a lid on inflation without help from the Fed. The pieces may be falling into place for the U.S. to experience a rare “soft landing,” which is an economy slowing down, but avoiding a recession. This is a recovery cycle where over-heating is avoided, and the Fed does not tighten rates in a manner that throws the economy back into recession—the economy experiences a moderation of growth without outright contraction. If a tight labor market begins to restrain economic growth, but the structural factors of technology and automation keep overall wage growth (and inflation) in check, then perhaps the Fed will only need to modestly increase rates from where we are now, and a soft landing could be achieved. This is not how things typically play out in the U.S. Historically, we’re much more prone to boom and bust cycles, but there is a growing chance that a tight labor market and convergence of other factors may help us achieve the elusive soft landing for our economy. * When will the bull market end?